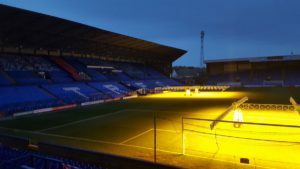 The Wirral hosted its first ever sleep-out in Prenton Park, with the quirkily named Kip on the Kop which brought Wirral Churches Ark Project and Tranmere Rovers FC together to help fight against homelessness. Dozens of people showed up on Friday night to see how long they were able to last in cold, rainy and windy conditions as participants were to spend 12 hours out in Rovers’ Kop end. The whole point of the event was to raise money and awareness, but also to give the people taking part an idea of what it’s like to sleep on the street. The people roughing it were in high spirits despite the bitter weather. Everyone had their sleeping bags and carboard ready for a harsh night in the wet. Wirral Ark offers support, advice and shelter to the homeless, whether they have suffered unfortunate life-changing events or a have a drug problem. Wirral Ark fundraiser, Pauline Cox, got the ball rolling with this idea after talking inspiration from Everton’s sleep-outs.
? A big thank you and good luck to everyone taking part in Kip on the @Essar Kop tonight!